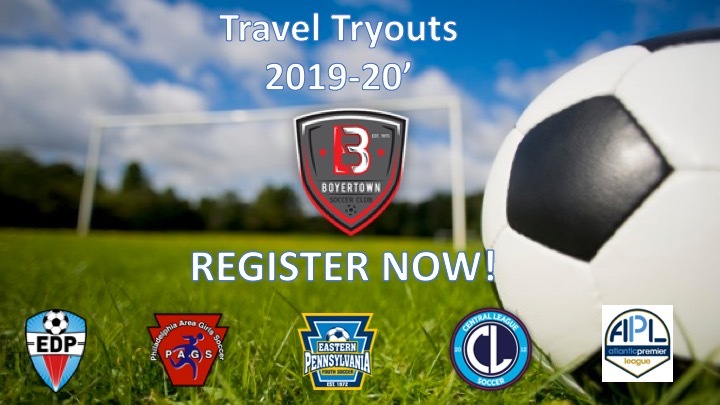 Travel Tryouts for the 2019-2020 are open, please click the link below to get started. Tryouts will take place at Upper Perk High School Turf field at 2 Walt Road, Pennsburg, PA 18073 or possibly at Layfield Location at 1 Garnet Drive, Gilbertsville PA 19525. Please arrive to the field no later than 10-15 minutes prior to the starting time for the tryout and continue to check website for any updates to locations or times as it may change. The coach will update all who is registered for their age group with any updates as well before tryouts start. The chart below lists the specific tryout dates and times for each age group. Most tryouts will take place at Upper Perk High School on the turf fields or otherwised noted below. All players who are interested in trying out for a travel team will need to complete the online registration form. Tryout registration and attendance for a BSC travel team is free! The following items are required to tryout for a BSC travel team, and must be submitted at the first tryout your child attends. A COPY of your child's birth certificate if he or she is NEW to the BSC travel program. Note: Players are asked to not wear a travel soccer jersey to tryouts. The tryout process is independent and non-biased, so this policy will help enforce that. Thank you for your help with this. All players are asked to complete the online registration form to register for tryouts. Print and complete necessary forms listed above and compile documents. Get out and touch the ball: 15 minutes a day can yield over 1,000 touches...that's 7,000 touches per week!! Arrive at the field no later than 15 minutes prior to the scheduled start time. Come prepared at the first tryout with all necessary paperwork and documents. Every player must attend at least one of the two scheduled tryout sessions. Give your best effort...that's all we can ask! After the final tryout, the coaches and evaluators will meet to create rosters. The rosters will be presented to the Director of Travel and the Travel Committee and then presented to the Board of Directors for approval. As soon as the rosters are approved, the head coach from that age group will contact each player who tried out. Players will be informed no later than one week after the last tryout.